Last season Reims, under the name of Saint Jacques, were having a great season in the LFB and had already signed Pauline Jannault and Leah Metcalf for the new season. However the club was relegated from the LFB due to their financial position and the players with the exception of Manon Sinico left the club. The players signed who had left had to find new clubs. This season Reims Basket Féminin now in pink (sometimes wearing the yellow of Saint Jacques) are lying in 15th place with just one victory from their seven outings. Their only victory came in the second round against Nice BC 06 (82-72). This weekend they travelled to Charnay-lès-Macon who were without Melissa Washington. Despite leading by 8 points with seven minutes to play they ended up losing (69-62). Charnay had the better start and appeared to have the game under control with an 11-point lead at the interval(37-26). Manon Sinico and Zuzana Gujaraidze (Klimosova) went to work offensively for Reims as they outscored their hosts 22-9 in the third period. Reims were playing aggressively and leading by 8 points, they were to lose four of their starting five players with 5 fouls during the final quarter. The hosts took full advantage of the situation and outscored their guests 13-2 to win the game. The NF1 basketball apprenticeship will continue as they play CFBB on Wednesday in the rescheduled game from round 4. Union Hainaut Basket-Saint Amand ended the perfect season of Dunkerque with a road victory (67-56). UHB-SA led (8-0) with a little of three minutes played and held the advantage until the end of the first quarter (18-12). Dunkerque clawed their way back and went into the lead briefly (23-22) with 16 minutes played. UHB-SA quickly recovered and regained the advantage to go in front (32-27) at the break. The advantage swung from one side to the other all through the third period with UHB-SA holding on to the lead (49-43) going into the final period. Clémence Beikes was the driving force as UHB-SA went 12 points clear with five minutes left to play. Beikes led the scoring with 15 points and 12 rebounds while Laëtitia Kamba also scored 15 points. Karolina Piotrkiewicz and Janeka Lopp added 13 points each. 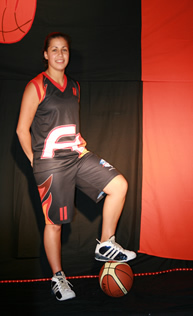 Bénédicte Fombonne was the top scorer for Dunkerque with 16 points which included 9-of-9 from the free-throw line. The CFBB were unable to repeat their success of last season and lost to Pleyber-Christ (49-80). For Pleyber-Christ Naignouma Coulibaly finished with a double-double 24 points and 13 rebounds. Nice BC 06 recovered from their defeat last weekend to beat Lyon (84-75) whereas US Laveyron were taken to the wire in beating Tours (66-65). Charleville-Mézières announced during the week that Lala Wane's season was over after injuring her shoulder in training. She would require an operation and then six months of rehabilitation. As a result Belinda M’Boma made her return to NF1 basketball. Charleville-Mézières beat CSP Rezé (102-74) with Amel Bouderra (left) leading the way with 24 points and 6 assists. In the final matches, there was no joy for the teams playing at home. Illkirch-Graffenstaden fell at home (68-75) against Voiron while Rennes was also beaten on their home court (60-68) to Roche Vendée.